Electronic project enclosures are often needed to house assembled printed circuit board and other electronic parts. One of the reasons they are used is to ensure that user does not touch parts which are hazardous and to prevent electric shock. A well designed enclosures also has good aesthetic outlook. For most electronics hobbyists, it is too costly to design a custom make enclosure as the amount of investment needed to design, making molds and injection of parts. Unless the quantity needed is big, it is always advisable to source for a standard enclosure available in the market. There are basically rectangular, slanted, t-shape or readout style. Rectangular type is rectangular in shape with the top and bottom surfaces parallel to each other. Slanted type is also rectangular but with the top surface slanted with an angle with respect to the bottom surface. T shape type has a lower portion narrower than the upper portion and used in handheld applications. 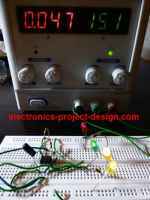 Readout type is rectangular with a section of the top surface sloped for LCD or LED readout. The main consideration in selecting a suitable enclosure it to make sure its dimension fits the printed circuit board. Common assembly styles include glue, snap together, screw together or hinged cover. The type can be clear transparent plastic, infrared plastic which is transparent to the infrared signal or solid plastic. Some can have batteries compartment for AA batteries, AAA batteries or even 9 V batteries. Common materials of construction for electronic enclosures are Acrylonitrile-butadiene-styrene (ABS), aluminum, polycarbonate, polystyrene, stainless steel, and steel. ABS is a hard, rigid, thermoplastic polymer. It provides good chemical and creep resistance, and dimensional stability and is the most commonly available material. Aluminum has good electrical and thermal conductivity, high reflectivity, and resistance to oxidation. Polycarbonate is an amorphous material with excellent Impact Strength, clarity, and optical properties. It also can be molded to tight tolerances for products that need tight dimensional accuracy. Stainless steel is chemical and corrosion resistant. Enclosure can also be designed to shield against electromagnetic interference by coating it with EMI or RFI coatings. It can also be constructed of flame retardant material for applications that need to have a high degree of safety.